This thread is a guide to sites that are either dedicated to evolution or have a significant area devoted to the subject. I have tried to stick to what can be recognised as reputable organisations. Sites for a younger audience are often mixed in with teaching resources so they are all there together. This is not a intended to be a discussion thread so if you find something you would like to comment on please copy the relevant parts and start a new thread. It you want to add new sites and links please do! Frequently asked questions about evolution What is evolution? Biological evolution refers to the cumulative changes that occur in a population over time. These changes are produced at the genetic level as organisms' genes mutate and/or recombine in different ways during reproduction and are passed on to future generations. Sometimes, individuals inherit new characteristics that give them a survival and reproductive advantage in their local environments; these characteristics tend to increase in frequency in the population, while those that are disadvantageous decrease in frequency. This process of differential survival and reproduction is known as natural selection. Non-genetic changes that occur during an organism's life span, such as increases in muscle mass due to exercise and diet, cannot be passed on to the next generation and are not examples of evolution. Understanding Evolution, University of California Understanding Evolution is a non-commercial, education website, teaching the science and history of evolutionary biology. This site is here to help you understand what evolution is, how it works, how it factors into your life, how research in evolutionary biology is performed, and how ideas in this area have changed over time. Howard Hughes Medical Institute lots of articles on evolution regularly updated. The Talk Origins Archive is a collection of articles and essays, most of which have appeared in talk.origins at one time or another. The primary reason for this archive's existence is to provide mainstream scientific responses to the many frequently asked questions (FAQs) that appear in the talk.origins newsgroup and the frequently rebutted assertions of those advocating intelligent design or other creationist pseudosciences. PBS Evolution, the journey. A wide selection of videos, very accessible, including one about the evolution of the eye. The complete works of Charles Darwin Everything Darwin ever produced. This website is the largest collection of writings by and about Darwin ever published. It contains his complete publications, thousands of handwritten manuscripts and the largest Darwin bibliography and manuscript catalogue. There are also over 200 supplementary texts, from reference works, reviews, obituaries, biographies and more. Interactive Time Line Very informative interactive timeline going back to the Big Bang. It takes a few seconds to load. Unless your screen is quite wide you can’t see the right hand end of the line which is our bit. Evolution and the Fossil Record This non-technical introduction to the fossil record and evolution, produced by the American Geological Institute in cooperation with the Paleontological Society, aims to help the general public gain a better understanding of one of the fundamental underlying concepts of modern science. Also has a 36 page booklet. Tree of Life Web Project The Tree of Life Web Project (ToL) is a collaborative effort of biologists from around the world. On more than 9000 World Wide Web pages, the project provides information about the diversity of organisms on Earth, their evolutionary history (phylogeny), and characteristics. Becoming Human Organisation The Institute of Human Origins (IHO) conducts, interprets and publicizes scientific research on the human career. IHO’s unique approach brings together scientists from diverse disciplines to develop integrated, bio-behavioural investigations of human evolution. Through research, education, and the sponsorship of scholarly interaction, IHO advances scientific understanding of our origins and its contemporary relevance. Combining interdisciplinary expertise and targeted funding, IHO fosters the pursuit of integrated solutions to the most important questions regarding the course, cause and timing of events in human evolution. Fossils Window to the past An excellent guide to fossils and fossilisation. Part of the University of California Museum of Paleontology (sic). The Society for the Study of Evolution Subscription site for serious study. The Society for the Study of Evolution was founded in March, 1946. The objectives of the Society for the Study of Evolution are the promotion of the study of organic evolution and the integration of the various fields of science concerned with evolution. The Society publishes the scientific journal Evolution and holds annual meetings in which scientific findings on evolutionary biology are presented and discussed. Dawin Manuscripts The origins of Darwin’s theory of evolution – including the pages where he first coins and commits to paper the term ‘natural selection’ – are being made freely available online in one of the most significant releases of Darwin material in history. In total, Cambridge Digital Library is releasing more than 12,000 hi-res images, alongside transcriptions and detailed notes as a result of an international collaboration with the Darwin Manuscript Project, based at the American Museum of Natural History. These papers chart the evolution of Darwin’s journey, from early theoretical reflections while on board HMS Beagle, to the publication of On the Origin of Species – 155 years ago today. The launch of Darwin’s papers also marks the end of the first phase of funding for Cambridge’s Digital Library, launched to worldwide acclaim in 2011 with the publication of Isaac Newton’s scientific archive. Initial £1.5m funding for the Digital Library was provided by the Polonsky Foundation. Funding for the digitisation and transcription of the Origin papers was provided by the US National Endowment for the Humanities and National Science Foundation. The Virtual Fossil Museum Fossils across geological time presented in multiple contexts of geological history, the tree of life, paleobiology and evolution. The Virtual Fossil Museum is an educational resource providing an ever-growing extensive collection of fossil images. London’s Natural History Museum Welcome to the Natural History Museum. We promote the discovery, understanding, enjoyment, and responsible use of the natural world. Explore our world-class collections, fantastic exhibitions and cutting-edge research online, or visit our landmark buildings. University of Nebraska State Museum Explore Evolution is a major new partnership forged between science museums and 4-H organizations to bring current research on evolution to the public. The project features the work of scientists who are making leading discoveries about the evolution of life. From rapidly evolving HIV to whales that walked, the public is invited to explore evolution in organisms ranging from the very smallest to the largest. Arizona Museum of Natural History The Arizona Museum of Natural History is the premier natural history museum in Arizona. It is dedicated to inspire wonder, respect and understanding for the natural and cultural history of the Southwest. Explore Arizona and the Southwest from the creation of the earth 4.5 billion years ago to the present. See the origins of life on earth, meteorites and minerals. In Dinosaur Hall, discover some of the biggest dinosaurs that ever lived, and on Dinosaur Mountain see how some appeared and sounded in a natural context. In a Walk through Time, explore ancient Arizona’s Paleozoic Seas, Triassic Petrified Forest, monsters of the Cretaceous Seas, and the first animals to fly. Evolution Resources From the National Academies This Web page is designed to provide easy access to books, position statements, and additional resources on evolution education and research. These materials have been produced by the National Academies and other sources. National Center for Science Education The National Center for Science Education (NCSE) defends the teaching of evolution in public schools. We are a nationally-recognized clearinghouse for information and advice to keep evolution in the science classroom and "scientific creationism" out. NCSE is the only national organization to specialize in this issue. The Evolution Report, hosted by Paul Wilson The Evolution Report is a series of audio programs on evolutionary topics. It is primarily intended to be supplemental instruction for BIOL 322 Evolutionary Biology. Students say that they don't have enough time to study more than they are already studying, but many spend tons of down-time in their cars and relaxing before bed. Our idea then was to produce an entertaining show that could be listened to during this down-time and that would not consume high-quality time. The goal is to make evolutionary topics more familiar. Alfred Russell Wallace deduced the application of natural selection to evolution independently of Charles Darwin. While Darwin deduced natural selection to be the 'engine' of evolution some 18 years before Wallace he did not publish his thoughts. It was only when he received a paper from Wallace in 1858 that Darwin's friends convinced him to publish or see all his own work go to waste. The text of the joint paper, presented without Wallace's knowledge, can be read here The 1858 Darwin-Wallace paper. History of Evolution A single page history of the concept of evolution. Darwin Day Darwin's 200th Birthday occured on February 12, 2009; it was the 150th Anniversary of the publication of his famous book, On The Origin of Species. A truly international celebration to express gratitude for the enormous benefits that scientific knowledge, acquired through human curiosity and ingenuity, has contributed to the advancement of humanity. Digital Morphology The Digital Morphology library is a dynamic archive of information on digital morphology and high-resolution X-ray computed tomography of biological specimens. Browse through the site and see spectacular imagery and animations and details on the morphology of many representatives of the Earth's biota. A few selected transitional fossils "All species undergo gradual change over time, but in the fossil record we find evidence of some changes that are particularly striking. This website is dedicated to some of these so-called transitional fossils." Gene Expression and Regulation A page with an excellent introductory essay on the way that genes function in an organism, with links to a large selection of articles dealing with more specific aspects of the topic. OneZoom Tree of Life Explorer "An interactive map of the evolutionary relationships between 1.8 million species of life on our planet. Each leaf on the tree represents a species and the branches show how they are connected through evolution. Discover your favourites, see which species are under threat, and wonder at over 100,000 images on a single page." "How do we know that evolution is really happening?" A well written, illustrated article from the BBC that examines the theory of evolution and the current evidence that supports its veracity. The Burgess Shale Details of one of the most significant fossil beds ever found. "High on a mountain ridge in Canada’s spectacular Yoho National Park in British Columbia is one of Earth’s most important fossil deposits: the Burgess Shale. Preserved with exquisite detail within the rock layers for the last half-billion years are the remains of soft-bodied and often bizarre animals and algae dating from the Cambrian period. 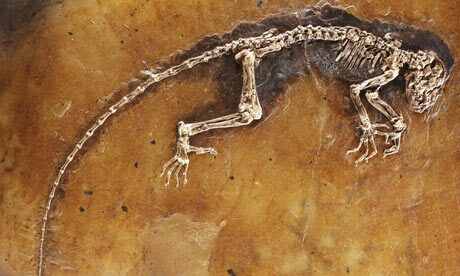 These exceptional fossils include some of the oldest members of many animal groups still alive today. " Evidence for the Evolutionary Model An excellent resource for primary information such as ERVs and rebuttal's of creationist codswallop. By the nature of blogs there will be all sorts of things here so dive in and have a look. The Panda’s Thumb is the virtual pub of the University of Ediacara. The patrons gather to discuss evolutionary theory, critique the claims of the antievolution movement, defend the integrity of both science and science education, and share good conversation. Pharyngula is the blog of PZ Myers a biologist and associate professor at the University of Minnesota. Evolution, development, and random biological ejaculations from a godless liberal! Some people wish to refute or deny evolution exists or has ever happened and demand examples as proof. These links are hard scientific evidence of evolution, if somebody felt that they had a good case to refute evolution they would have to categorically disprove these examples in open scientific debate. They are provided for information. If you have any original source material of this nature please send the details to me in a PM. Abstract. Freezing avoidance conferred by different types of antifreeze proteins in various polar and subpolar fishes represents a remarkable example of cold adaptation, but how these unique proteins arose is unknown. We have found that the antifreeze glycoproteins (AFGPs) of the predominant Antarctic fish taxon, the notothenioids, evolved from a pancreatic trypsinogen. We have determined the likely evolutionary process by which this occurred through characterization and analyses of notothenioid AFGP and trypsinogen genes. The primordial AFGP gene apparently arose through recruitment of the 5 and 3 ends of an ancestral trypsinogen gene, which provided the secretory signal and the 3 untranslated region, respectively, plus de novo amplification of a 9-nt Thr-Ala-Ala coding element from the trypsinogen progenitor to create a new protein coding region for the repetitive tripeptide backbone of the antifreeze protein. The small sequence divergence (4-7%) between notothenioid AFGP and trypsinogen genes indicates that the transformation of the proteinase gene into the novel ice-binding protein gene occurred quite recently, about 5-14 million years ago (mya), which is highly consistent with the estimated times of the freezing of the Antarctic Ocean at 10-14 mya, and of the main phyletic divergence of the AFGP-bearing notothenioid families at 7-15 mya. The notothenioid trypsinogen to AFGP conversion is the first clear example of how an old protein gene spawned a new gene for an entirely new protein with a new function. It also represents a rare instance in which protein evolution, organismal adaptation, and environmental conditions can be linked directly. Abstract. According to the theory of common descent, modern living organisms, with all their incredible differences, are the progeny of one single species in the distant past. In spite of the extensive variation of form and function among organisms, several fundamental criteria characterize all life. Some of the macroscopic properties that characterize all of life are (1) replication, (2) heritability (characteristics of descendents are correlated with those of ancestors), (3) catalysis, and (4) energy utilization (metabolism). At a very minimum, these four functions are required to generate a physical historical process that can be described by a phylogenetic tree. What Darwin Never Knew Broadcast (2010) Earth teems with a staggering variety of animals, including 9,000 kinds of birds, 28,000 types of fish and more than 350,000 species of beetles. What explains this explosion of living creatures, 1.4 million different species discovered so far, with perhaps another 50 million to go? The source of life's endless forms was a mystery until Charles Darwin's revolutionary idea of natural selection, which he showed could help explain the gradual development of life on Earth. But Darwin's radical insights raised as many questions as they answered. What actually drives evolution and turns one species into another? And how did we evolve? On the 150th anniversary of Darwin's "On the Origin of Species," NOVA reveals answers to the riddles that Darwin couldn't explain. Breakthroughs in a brand new science nicknamed "evo devo" are linking the enigma of origins to another of nature's great mysteries, the development of an embryo. NOVA takes viewers on a journey from the Galapagos Islands to the Arctic and from the Cambrian explosion of animal forms half a billion years ago to the research labs of today. Here scientists are finally beginning to crack nature's biggest secrets at the genetic level. And, as "NOVA" shows, the results are confirming the brilliance of Darwin's insights while exposing clues to life's breathtaking diversity. Revealing the Link Ida's very own website. Ida is a 47 million year old, perfectly preserved primate recovered from the Messel Pit in Germany. lived 47 million years ago, her features show striking similarities to our own. Complete Primate Skeleton from the Middle Eocene of Messel in Germany: Morphology and Paleobiology formal paper on Ida's discovery. Darwinius masillae represents the most complete fossil primate ever found, including both skeleton, soft body outline and contents of the digestive tract. Study of all these features allows a fairly complete reconstruction of life history, locomotion, and diet. Any future study of Eocene-Oligocene primates should benefit from information preserved in the Darwinius holotype. Of particular importance to phylogenetic studies, the absence of a toilet claw and a toothcomb demonstrates that Darwinius masillae is not simply a fossil lemur, but part of a larger group of primates, Adapoidea, representative 1of the early haplorhine diversification. The whole paper can be printed or downloaded as a PDF file at the site. Richard Lenski started an experiment more that 20 years ago in February 1988, every day since then he and his students have carried out the following procedures. By early 2008 45,000 generations of E. coli had been produced under rigorous laboratory conditions. There are 12 populations of E.coli and all are treated in exactly the same way. 3. Mean fitness, relative to the ancestor, is estimated using the mixed-population samples. Note that "3" can be done anytime after "2". Each of these tasks is described in detail below. 3. Liquid cultures and agar plates are incubated at 37C. 5. The mixed-population samples are stored indefinitely and can be used to re-start the cultures. * Daily transfers should be made 22-26 hours after the previous day's transfer. * Label 12 flasks as A+1 through A+5 and A-1 through A-6. (Check flasks and beaker tops for cracks.) Add 9.9 ml of DM25 to each flask. * Remove 12 flasks from shaking incubator. Visually confirm (slight) turbidity of each. * Propagate 12 cultures by transferring 0.1 ml from previous day's cultures into fresh DM25. While transferring, strictly alternate between + and - cultures. This maximizes our ability to detect any inadvertent cross-contamination. * Incubate the new flasks in the shaking incubator at 37C and 120 rpm. * Be sure to record each day in the notebook by day number. * Every 75th day ( = 500 generations), the evolving populations are themselves stored away in the ultra-low freezer at -80C. * Perform the daily transfer as always. Also, plate for colonies to check for contamination. * Number and label 12 large and 12 small freezer vials. Numbering should begin after the last number used for the entire freezer collection. The large and small freezer vials receive duplicate numbering; the small vials provide back-ups. In addition to putting number stickers on top, use a blue marker to write numbers and strain identifiers on the vials. Record the strain numbers and identifications in the lab notebook, noting in particular that these are "mixed-population samples" (not clonal isolates). * To each of the previous day's cultures, add glycerol (about 1 ml) from the small tubes. Swirl to mix the glycerol well with the culture; this takes some effort owing to the viscous nature of the glycerol. * Using an individually wrapped, sterile bulb-pipette for each culture, transfer 1 ml to the appropriate small vial and 5 ml to the corresponding large vial. The vials are then stored away in the appropriate freezer boxes. The environment was controlled for temperature and availability of nutrients. Without mutation there would have been no change in any of the characteristics of the organism in any of the 12 populations. Just one example of change is shown here Cell Size Data Through Generation 10,000. All the populations started out with an average volume of 0.3725 fL (Femto Litres, 10-15 L) by the 10,000th generation the average volumes of the cells in all populations had increased within the range 0.655 fL to 1.1 fL. This is just one example of adaption where a larger cell has a reproductive advantage over a smaller cell. If you wish to read further then I would suggest this .pdf Historical contingency and the evolution of a key innovation in an experimental population of Escherichia coli. Abstract: The role of historical contingency in evolution has been much debated, but rarely tested. Twelve initially identical populations of Escherichia coli were founded in 1988 to investigate this issue. They have since evolved in a glucose-limited medium that also contains citrate, which E. coli cannot use as a carbon source under oxic conditions. No population evolved the capacity to exploit citrate for >30,000 generations, although each population tested billions of mutations. A citrate-using (Cit+) variant finally evolved in one population by 31,500 generations, causing an increase in population size and diversity. The long-delayed and unique evolution of this function might indicate the involvement of some extremely rare mutation. Alternately, it may involve an ordinary mutation, but one whose physical occurrence or phenotypic expression is contingent on prior mutations in that population. We tested these hypotheses in experiments that ‘‘replayed’’ evolution from different points in that population’s history. We observed no Cit+ mutants among 8.4 X 1012 ancestral cells, nor among 9 X 1012 cells from 60 clones sampled in the first 15,000 generations. However, we observed a significantly greater tendency for later clones to evolve Cit+, indicating that some potentiating mutation arose by 20,000 generations. This potentiating change increased the mutation rate to Cit+ but did not cause generalized hypermutability. Thus, the evolution of this phenotype was contingent on the particular history of that population. More generally, we suggest that historical contingency is especially important when it facilitates the evolution of key innovations that are not easily evolved by gradual, cumulative selection. If you found that all rather dry a much more accessible description appears in chapter 5 'Before our very eyes' pages 116-133 'Forty-Five thousand generations of evolution in the lab.' of Professor Dawkins' book The Greatest show on Earth. It is but a single snowflake on the tip of the glacier of information about the Theory of Evolution and it's a glacier that is growing all the time and grinding away ignorance as it does. I saw this when I was looking about. Some you probably know well and some you've probably ran across before, but I hope a few are new and many can learn from their pages. Seven short videos for those starting out understanding what evolution is. Evolution Primer#1: Isn't Evolution just a theory? Evolution Primer #7: Why Is Evolution Controversial Anyway? This video is particularly intereasting if you are a theist as it explains how and why theists should accept evolution. It features Ken Miller a devout Catholic and professor of Biology who stood up against the cretionist point of view at the Dover trials. Back in late 2009, we started offering free evolution book excerpts on the NCSE web site and via Facebook. The excerpts—often complete chapters—were culled from a range of tomes, from illustrated versions of the Origin to textbooks (such as Douglas Futuyma's Evolution) to kids books (such as Evolution: How We and All Living Things Came to Be). Follow this link to see what is available Free evolution book downloads! This post by xSilverPhinx brings together some good resources for the person just starting to get their head around evolution. IMO Dawkins is very good at explaining evolutionary theory to laypeople (even those who haven't had any high school classes on the subject) quite well. The problem is since many people are a bit...erm...hostile towards him they don't really give what he says due attention. If you want to broaden it to the topic of skepticism in general, then Sagan is the best. I suggest you read the material she's been reading first, and get to know creationist tactics well before you try and refute them. Focus heavily on the ideas she has on what evolutionary theory is first, before you focus just on the objective evidence. If she doesn't know first that all the creationist arguments are ridiculous strawmen, then she might be more susceptible to confusion. I like using the 'shock and awe' approach to do this. You could come out and say something like "if ducks would mate with crocodiles and produce crocoducks, then that would mean that there is something really wrong with evolutionary theory. It doesn't predict such a thing. Same thing for two ducks giving birth to a crocoduck. If that were ever to happen then something is patently false and the whole theory would need massive readjusting. That is not what transitional species are all about. And btw, only species evolve, not individuals (gene frequency in populations). And also, the common-sense idea that people have about evolution is basically a Lamarckist one, which was proven to be false (except for epigenetic inheritence) long ago. Larmarckism would say that an individual feels the need to evolve for a certain purpose, does, and passes the trait on. The common giraffes stretching their necks to reach higher branches scenario. It's also good to be keenly aware of the fact that most creationists are coming from a know-more-than-those-who-actually-do-know stance and are confident in their ignorance (or disinformation). To those who don't know enough to know otherwise, that's a point in the creationist's favour. Someone spewing out their dribble with confidence makes that person more of an expert than an actual expert in the eyes of the ignorant and scientifically illiterate (if you ever watch debates... ), so if you're unable to refute her points or answer her questions well, you might do more harm than good and push her more into creationism. There's a YouTube Channel which compiles some documentaries on evolution. You might want to check out Talk Origins for refutations to creationist claims, propaganda and misinformation too. I'm assuming you already have a good understanding of evolutionary theory, but I just thought I'd add the link in case anybody else is reading this. If you or your mom don't have the time to watch hour-long documentaries, then there are a few good summerised youtube videos (made by people who frequently deal with creationists). Potholer's 'Made easy' series are really good. He also has other good videos worth checking out too. Qualia Soup's 'Evolution' is good too, but it might be a bit rushed for someone who doesn't have a very basic idea of what evolution is. Found this place on-line if you want some fossils. They have been around for a while. Replicators are the fundamental units of any process of natural selection. They were first defined by evolutionary biologist Richard Dawkins as any entities of which copies are made. The concept of replicators has diverse applications in a variety of areas, including biology, sociology, linguistics, and philosophy. It has info on other forms of evolution as well. Wow! I just discovered this section, a treasure chest of information. Tank you must have spent a lot of time in the process of assembling this. Thanks much. It is appreciated.